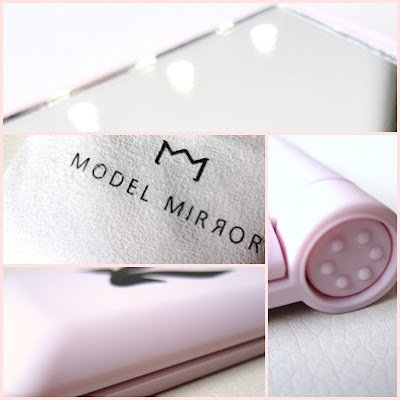 I first saw the chic Les Tai Tai LED mirror in a Pixiwoo Youtube video and instantly loved the idea of a compact mirror with lights - just so handy & unique! Now when it comes to more pricier products I always umm and arr whether to include them - but I always try to weigh up the pros and cons and this definitely came out as a more savvy purchase if you consider how long the compact will last before even needing to change the batteries (which you can just pick up from any supermarket). Plus I figured everyone likes to treat my selves now and again! 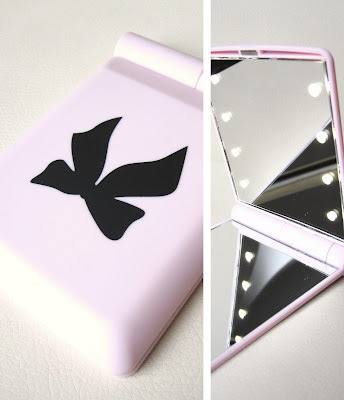 So anyways the new-ish Beau Bow mirror compact (Les Tai Tai - £19) with it's new non-slip rubber surface (much like the Barry M/Nars packaging) has been in my mitts for long enough to talk about it and I have to say I'm liking it. Very useful, indeed! The basic idea of the mirror is that you look in the normal non-lighted side with the lights shining downwards onto the face (though I find it works just as well if you hold it sideways), illuminating the whole face. Simple, simple! But the great thing is it actually works well, no nasty blue or yellow cast to the face from the 8 LED lights, just great artificial but natural light if that makes sense! Perfect for re-touching makeup in. The other side of the mirror is 2x magnified and can be looked into with or without the lights on - I really do prefer to use it with the lights on as you really can see every details, which some may say is a bad thing, but I do like enjoy inspecting my face before I go to bed at night - just to make sure my pores aren't looking particularly bad! Other features I like - It has that it can almost double over and stand up by itself on any surface (should of taken a picture really) but basically it can make a tent like shape so you can use either side without holding it up. Also for the size and function of it it actually weighs nothing, which is great! Features I don't love - Now I am being picky with this as it is nice touch that it comes with a carrying pouch that also doubles up as a polishing cloth. But it being white is just pointless as I know I will be getting makeup, biro and other miscellaneous items that get throw into my bag, onto it. I know that other designs come with a black pouch - so I think they should either be all black or at least a choice or white or black. I also think the compact is slightly too large, shave afew cm's off each of the sides and it would be perfect. But right now it can't help but remind me of the electronic address book I had when I was 10 - though I did think it was amazing as the time. Aside from them two things I really do love it. Especially the built-in light function as it's just such good quality and illuminates the face so evenly however dark of a situation it is. You can see all the Model Mirror designs here all priced at £19 and shipped worldwide! I like that very much!! WOW! I havent seen this before!! I love it! haha at picking on the white polishing cloth!...Too bleeding right you would think they would have realised this themselves! I love the bow on the front! At £19, it's a tad expensive though. It's a good idea with the lights inside - very similar to all those lipglosses with built in LEDs, but I bet this is brighter. wow love this design!! very cute!! I love to hear what you think and do read all comments. If you want to ask a question make sure to check back after afew days for a reply.